SAP certification is seen as challenging and tricky by most of the people who try to prepare for it. One of the challenges is directly related to SAP questions that are asked in the exams. It looks like SAP made them sound confusing and tricky on purpose and this way increased difficulty of SAP certification. The only thing that you can do before the exam in order to increase your chances for success is practice. Try to practice as much as possible and test your knowledge of SAP module where you would like to achieve certification from every possible angle. In order to help you with this pursuit, we collected some sample SAP questions for a variety of modules. 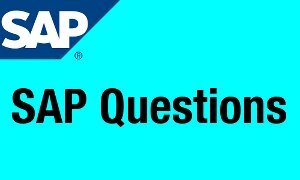 These sample questions never appeared at the actual SAP certification exams. We are not allowed to post questions from real SAP certifications because SAP prohibits it in the terms and conditions that everybody who attempts to pass SAP certification need to sign. The questions and answers that you find here were developed by freelance SAP trainers who are not affiliated with SAP. These SAP questions are simply questions that can be used for testing knowledge of concepts that are included in syllabuses for the respective certifications.